Grand Cross (グランドクロス, Grand Cross) is Simon and Richter's Final Smash. A large coffin appears in front of Simon/Richter, (with Richter saying "Now!") trapping fighters within it. The user then grabs the coffin with his chain whip, (with Simon saying "Away!") before swinging it in a wide arc before finally tossing it skyward, where it goes flying in front of the moon. Simon or Richter will then hunch over before flexing powerfully back with their chests pushed upwards and their arms bent, exclaiming "Grand Cross!" as a number of magical crucifixes made of energy erupt from the ground and batter the coffin holding the opponent. The opponents are then inflicted with heavy knockback as gameplay resumes. Richter using Grand Cross in the opening to Rondo of Blood. The Grand Cross is a technique that appears frequently in the Castlevania series beginning with Rondo of Blood. Given its power, it is typically difficult to use given the resources needed to perform it. Within the series canon, the first Belmont to use Grand Cross is Leon in Lament of Innocence, where he could do so after combining the Cross with the Yellow Orb. Since then, many Belmonts have been able to use Grand Cross, particularly Richter, who can use it in every game he appears in. Simon has never been able to use Grand Cross in the main Castlevania series games, but can do so in the fighting game Castlevania: Judgment. The Grand Cross's appearance in Ultimate is specifically based on its appearance in Rondo of Blood (albeit edited to less resemble a crucifix), where it was an Item Crash attack. Richter can equip the Cross as his sub-weapon and spend fifteen hearts to use Grand Cross. Item Crash attacks are typically very damaging and cover a wide area, not unlike some Final Smashes, but in Smash, the move is used as part of a trap and does not cover the stage. The energy like appearance may be inspired by how it appeared in Aria of Sorrow and Dawn of Sorrow. The graveyard that appears in the background resembles the graveyard that appears during the intro of Super Castlevania IV. Simon using Grand Cross as shown by a Skill Preview in Ultimate. 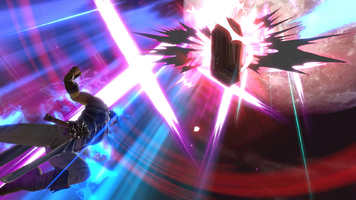 Richter using Grand Cross as shown by a Skill Preview in Ultimate. There is a glitch involving this Final Smash where if Simon traps a player at the last possible moment, the coffin will spin throughout the cutscene. This is because, if the Final Smash misses, the coffin will start to spin in circles before disappearing, but this animation starts before the trapping hitbox disappears. This page was last edited on April 2, 2019, at 18:38.